Here is Tariq Ali, interviewed in the recent issue of Adbusters, giving his advice to young people: "Follow your instincts. When your instincts tell you there is something corrupt and disgusting about the way the political establishment operates, you're 100% right. But don't just say that. Try and do something about it: in the realm of culture, in the realm of protests, in the realm of literature, in the realm of theatre. Do alternative things, and don't be too scared that if you do that, you won't be able to find a job. It's so much easier, with the development of technology today, to produce a magazine or a cracking ten minute documentary. We couldn't do that in the '60's. It's a totally different world, and there are enormous, enormous opportunities which should be used." Some of you know Sandor Katz from his earlier book, Wild Fermentation, and some of you may know him from a kim chee or sauerkraut workshop at Common Ground Fair or some other venue. 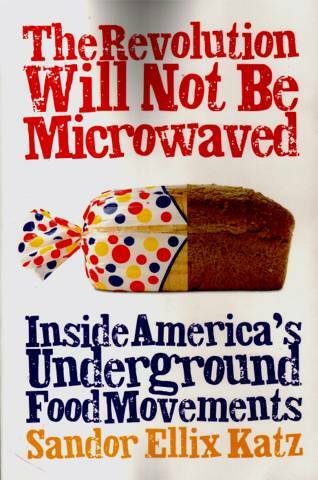 His new book, The Revolution Will Not Be Microwaved, should be read by anyone who eats food. Sandor says in the preface "All the crises of our postagrarian, postindustrial, postmodern time converge in the food we eat...Activists around the world are devoting themselves to the creation of better food choices. The chapters of this book explore ten different themes of food-related issues and activist projects. Far from comprehensive, this book aims to inspire you to become a food activist yourself, and in that process to become more connected to the sources of your food and water." 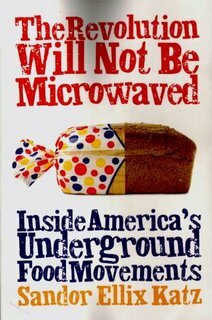 Howard Zinn says of this book "it points us not only to eating in a new way, but thinking in a new way. Here we see food with all its social and economic ramifications, to say nothing of its consequences for our health." Sandor points out that "Some people have the idea that food marketed as organic or locally grown is inherently elitist. We must acknowledge that to be in the position to be selective about the food we eat is to hold a privileged position." He then quotes author Lisa Heldke, who says "The question we must ask is not "How can we avoid privilege?" but "How can we work to undermine the structures that give me privilege in the first place?" I learned that I live in Clambake Nation, next to Maple Syrup Nation, that to eat organic produce trucked and flown or otherwise moved great distances might not be as good an idea, for the health of the planet, and that I really want to eat a paw paw. well, that and much more, in a political climate where "eating well has become an act of civil disobedience", we need to become better-informed citizens of our own regions, and of the world. This book is a wonderful step on that journey. For this holiday season we are suggesting that you not only support local businesses, but local writers and publishers.